BANGKOK, Thailand, October 11, 2011 (ENS) – Monsoon floods are threatening UN World Heritage sites in Thailand and the Philippines as heavy rains and high winds continue to lash countries across Southeast Asia. Floods in Thailand have killed more than 200 people, destroyed farmland, and forced thousands to evacuate low-lying land near rivers. Surging waters are now threatening a UN World Heritage site in the ancient city of Ayutthaya, which officials worry could suffer permanent damage. Hundreds of homes and businesses in Ayutthaya and the centuries-old Chaiwattanaram temple were submerged after heavy rains burst banks of the Chao Phraya River earlier this month. The UN cultural agency, UNESCO, says if the flooding gets worse the historic city’s World Heritage Sites on the other side of the river are at risk. The UN agency has offered Thailand emergency assistance if requested. 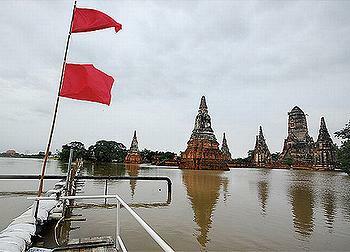 Thai weather forecasters say more rains are expected in the coming days and the situation is likely to get worse. The Chi and Tha Chin rivers on Tuesday overflowed their banks and flooded areas of Maha Sarakham province and Suphan Buri township, forcing people to flee to higher ground. Thai Army trucks today are carrying 150,000 sandbags no longer needed in the north, to Bangkok to build floodwalls to protect the capital. Since mid-September the sandbags have been used to build floodwalls along the Nan River. Now that the water in the Nan River is back at a normal level, the sandbags can be used to protect Bangkok. The Thai Meteorological Department forecast today that the wet season will end about the middle of October. In the Philippines, massive flooding brought on by back-to-back typhoons could last for a month, says the head of the country’s civil defense agency. Nesat hit the northern part of the Philippines on September 27, followed by Nalgae just five days later, bringing storm surges, flash floods and landslides. At least 95 people have died in the storms. Chest-high flood waters brought by typhoons Nesat and Nalgae are being worsened by continual rain in the coastal areas north of Manila, said National Disaster Risk Reduction and Management Council chief Benito Ramos. “This flooding is the effect of Nesat and Nalgae. It is still raining here so we expect at least two more weeks before the floods will subside,” said Ramos as he conducted an inspection of flooded areas. 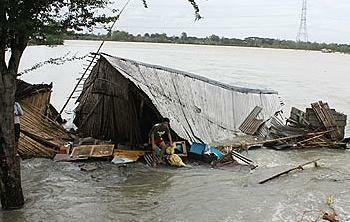 In all, four million people have been affected, mostly in the Central Luzon and Cagayan Valley regions. Strong winds and massive flooding caused damage to some 66,000 houses. More than 586,000 people have been forced from their homes by rising waters or unsafe conditions, the agency said. The International Federation of Red Cross and Red Crescent Societies has launched a preliminary emergency appeal for 3.5 million Swiss francs (US$3.9 million) to help the Philippine Red Cross deliver immediate assistance to 50,000 families, over 250,000 people. Today the eastern Visayas and northeastern Mindanao are in the path of Tropical Storm Ramon, which is carrying heavy rains and packing winds of up to 100 km/hr (60 mph). More than 200 families have been evacuated to higher ground. Flights in the region have been canceled and schools are closed. These storms are the latest of 11 destructive tropical cyclones that have struck the Philippines from May to October which battered almost all the provinces across Luzon island. Another UNESCO World Heritage site is flooded, this one 2,000 years old. 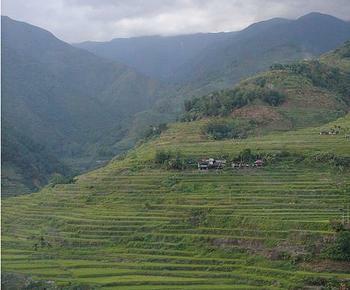 Typhoon Nesat blew across the Ifugao Province, causing major mud and landslides in the mountainous area of the World Heritage site of the Rice Terraces in the Philippine Cordilleras. Typhoon Nalgae crossed the same area five days later, causing more damage. Communication links to the area are still not fully functional and many roads remain blocked, so the full extent of the damage and possible loss of lives is still unknown. The Philippine authorities have informed UNESCO that they will be applying for emergency assistance under the World Heritage Fund to respond to this situation. The conservation of the 2,000 year-old rice terraces will require “substantial and concerted efforts” and the World Heritage Centre is exploring all possible means to respond to this situation as quickly as possible. President Benigno S. Aquino III has directed Public Works and Highways Secretary Rogelio Singson to study the existing protocol on dam management amid massive floodings in Central Luzon brought by the typhoons. Singson has been asked to develop methods to ensure that the waters coming from the highlands do not flow directly to the lowlands, presidential spokesman Edwin Lacierda said told reporters in Malacanang Monday. Malacanang stands by the report of government agencies that the flooding in Bulacan province was caused by heavy rains brought by typhoon Nesat and not the release of water from Angat Dam. Several towns in the province remain submerged. “Secretary Singson is coordinating with the National Water Resources Board, the National Power Corporation (Napocor) and all dam operators to discuss the existing protocol on the release of water from the dams,” said Lacierda. 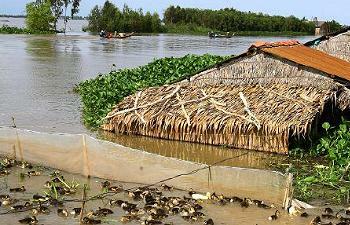 Heavy rains across Vietnam, Cambodia and Laos have resulted in record flood levels in Vietnam’s Mekong Delta. Authorities say water levels are at a 10-year high. At least 23 people have been killed, with 30,600 houses flooded and around 14,800 acres of rice crop submerged. An estimated 5.2 million people live in An Giang, Dong Thap and Long An; the three provinces that share the delta, and almost 245,000 acres of rice paddies are at risk. A Vietnam Red Cross Society national disaster response team was this week sent to the delta to carry out assessments and to identify families who are in the greatest need of assistance. The aid agency has sent one million water purification tablets and 3,000 household kits to Ho Chi Minh City.